While Hogtown is full of cranes there are none in Rome’s historical centre. On the other hand, in early June, the eternal city was overrun by a big HOG convention. While Toronto’s civic leaders battle over bicycles and LRTs, the eternal city has expanded its LRT system and its political and spiritual leaders have embraced bikes. 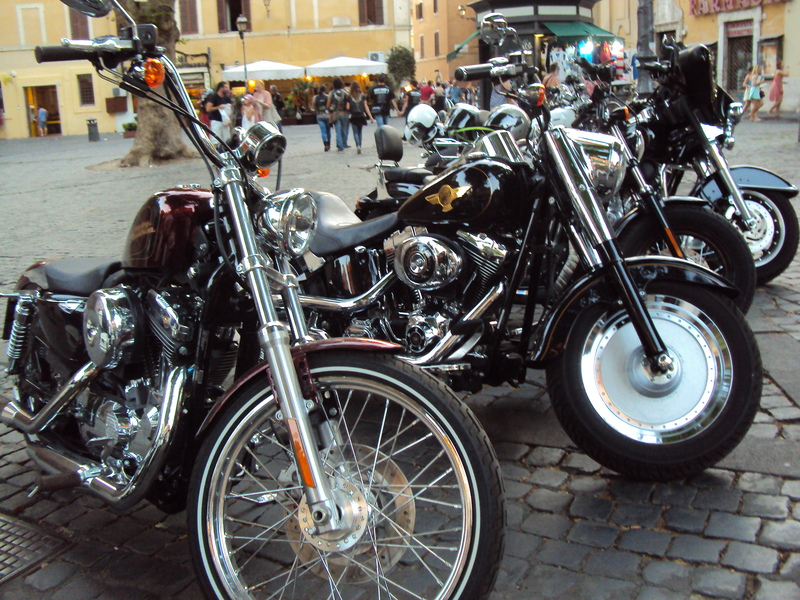 Motorcycles and Rome go together like tomato sauce and pasta but this past June, the downtown Roman neighbourhood in the historical centre, where I was staying, was besieged by motorcycles. 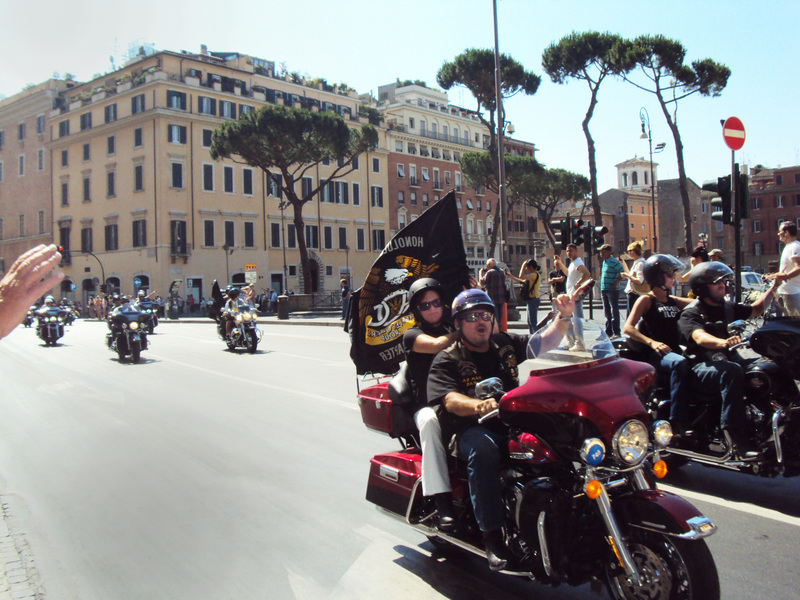 HOG (Harley-Davidson Owners Group) members invaded Rome on the company’s 110th anniversary. They were based in nearby Ostia for a multi-day celebration. Over 100,000 HOG members arrived from all corners of the earth. Traffic police managed the chaos as bikers roared through the streets and parked all over town. Wearing bandanas, sunglasses, black leather vests emblazoned with skulls, crests and badges, HOG members visited monuments and enjoyed Rome’s typical pasta dishes: penne alla puttanesca (penne whore-style) and strozzapreti alla gricia (choke-the-priest pasta with cheese and bacon bits). I saw them strolling through Campo de’ Fiori, gelato in-hand, and sipping late-morning cappuccinos at Caffè Sant’Eustachio, behind the Pantheon, before heading out on the road. Eight hundred of them showed up for the pope’s weekly Sunday appearance in St. Peter’s square. Bikers revved up their motors as Papa Francesco addressed the spectators and made his way through the crowd, blessing believers and kissing babies. One biker told Italy’s RAI news that he would, “love to take the pope for a ride”. 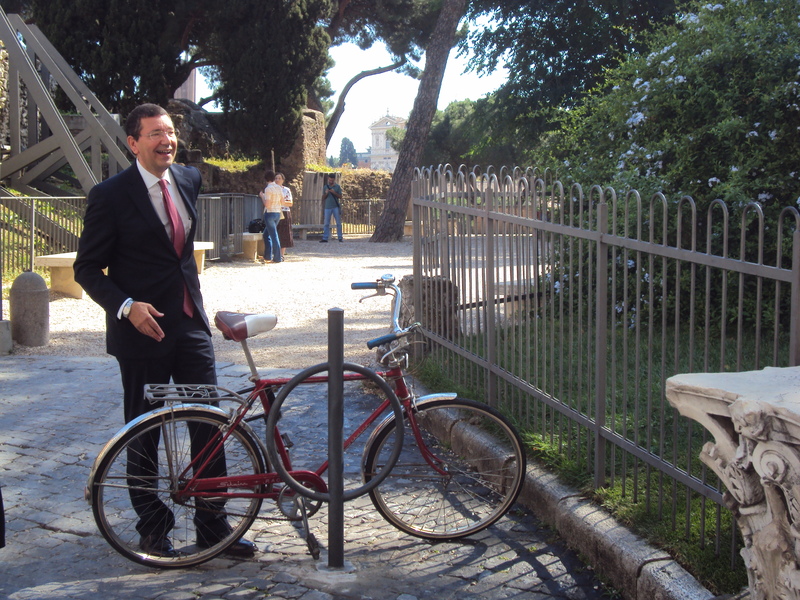 The second week in June, the newly-elected Mayor Ignazio Marino, a progressive who ousted Berlusconi’s man, Gianni Alemanno, hopped on a gearless red bicycle and rode around town in a suit and tie before heading to Rome’s city hall for his inauguration. 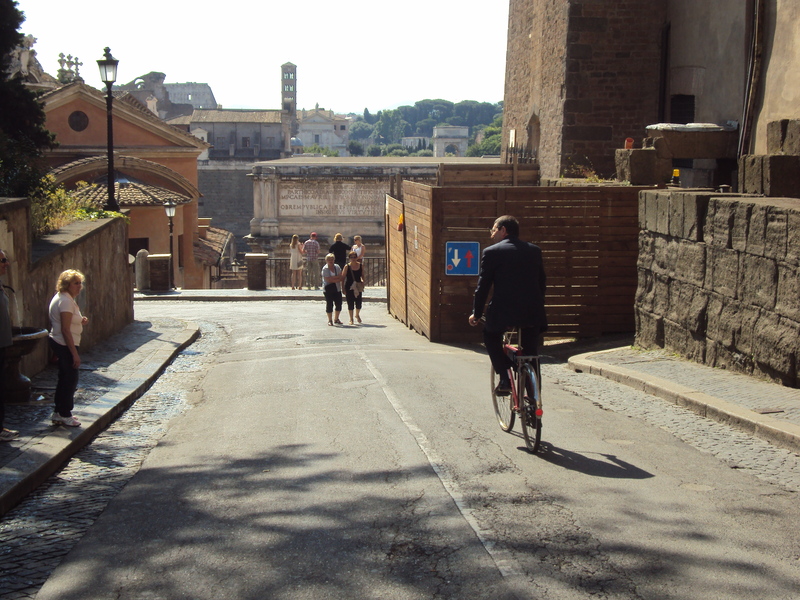 City workers at the Campidoglio, the ancient seat of Rome’s government, installed a bicycle stand for his use. 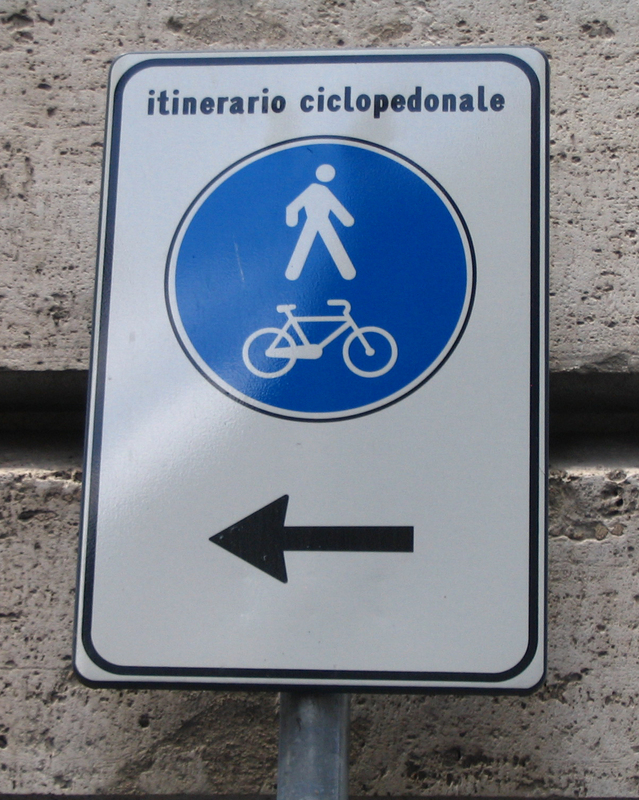 I saw the mayor getting on his bike just off the piazza designed by Michelangelo. Behind us stood the equestrian statue of Marcus Aurelius, beside us the statue of the she-wolf suckling Rome’s founding twins, Romulus and Remus. The police guards, dressed in white short-sleeve shirts, white caps, and dark pants – looking like naval captains – shared a chuckle with Marino as he approached his bike. He’s a novelty for Romans who are used to their politicians riding in sleek black cars with tinted windows. The mayor’s first order of business was to make via dei Fori Imperiali (the thoroughfare that leads to the Coliseum) an isola pedonale (pedestrian island) or pedestrian-friendly area – a first step towards establishing a car-free archaeological park. W asting no time keeping his election promise, on August 3rd Mayor Marino’s administration launched a trial run of the revamped Roman road and celebrated with an all-night street party. Anyone who has walked the busy, noisy, exhaust-infused road knows what an improvement this will be. 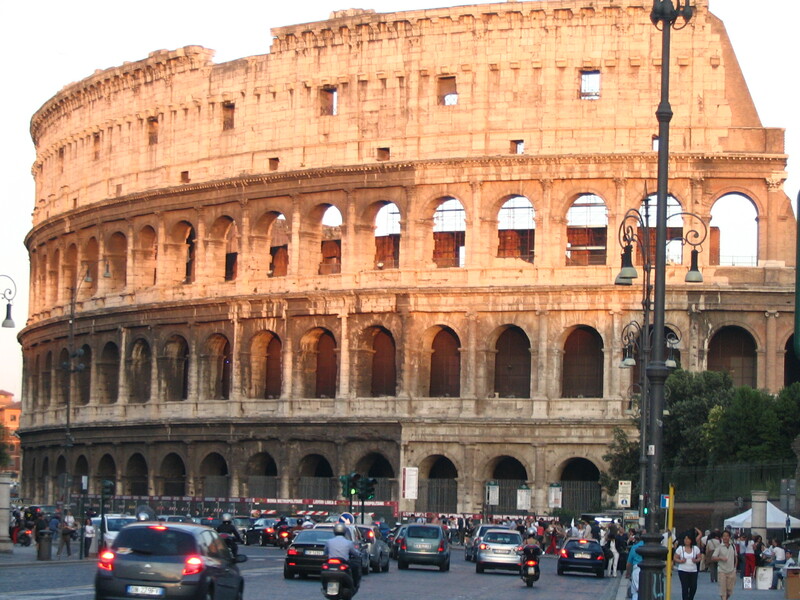 After all, the excessive rumbling traffic caused even the massive Coliseum to tremble. The new via dei Fori Imperiali includes the already planned LRT (with a right-of-way) currently under construction. The road will be open to buses, taxis and emergency vehicles. Cars have been rerouted to nearby major streets. In December, the width of the sidewalks will be doubled and a separate bicycle lane will be added. Traffic will be reduced from 1,200 cars per hour to fewer than 50 vehicles per hour. Mayor Marino arrived for the official opening and the all-night street party on his own bicycle. Theatrical and musical acts, acrobats, dancers, and street performers entertained thousands of spectators on the pedestrian-friendly, bicycle-friendly road. Bravo! Rome’s new mayor is in love with his city. Can lovelorn Toronto ever hope for the same? On June 10, after a two-day runoff vote, Romans elected Marino, a surgeon and specialist in liver transplants, who ran for the centre-left Partito Democratico (Democratic Party). “I hope that in the next few years Rome can be proud of me,” he beamed in front of reporters. I watched with envy. I used to compare notes with my Roman friends on the shortcomings of our respective mayors. Now, when they console me, they can barely hide their glee, “Don’t give up hope,” they say. In a landslide victory Marino beat out Berlusconi’s man, incumbent, Gianni Alemanno, 64% to 36%. In fact, Berlusconi’s centre-right party, Popolo della Libertà (People of Freedom Party), lost nationally in all of the 16 provincial capital cities’ mayoral races. 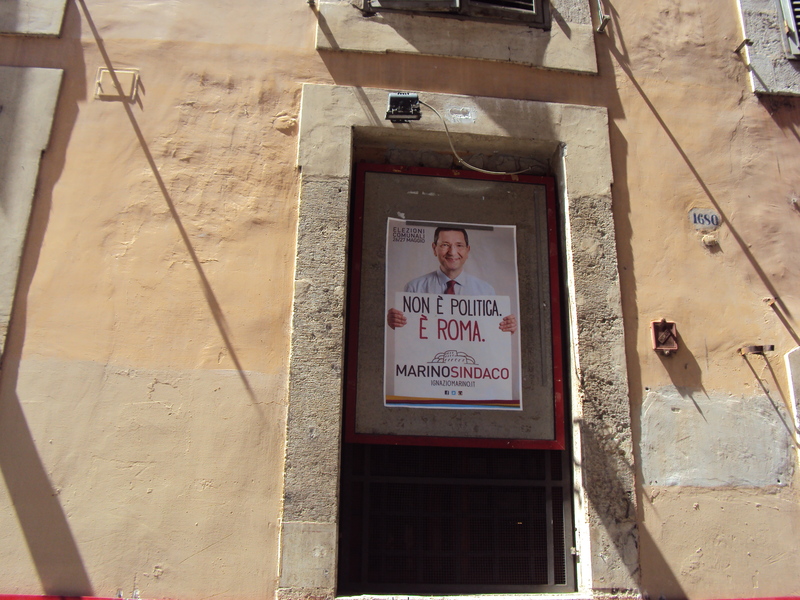 The Democratic Party’s historic neighbourhood office, near Campo de’ Fiori, was abuzz. Party supporters were all smiles as they acknowledged, “Ce l’abbiamo fatta.” (We did it). Marino, the new mayor, studied at Cambridge and at the University of Pittsburgh. He was department head at Jefferson Medical College in Philadelphia. In 2001, he performed the first organ transplant in Italy, on an HIV-positive patient. He entered politics hoping to improve Italy’s medical institutions. In 2006 he ran nationally as an independent and was elected senator. He was re-elected in 2008.